It was eerily quiet on Tuesday in parts of Bangkok that had been the scene of violent protests the day before. Bangkok, Thailand (CNN) -- The scene of one of the battlefronts between anti-government protesters and Thai soldiers looked different on Tuesday. 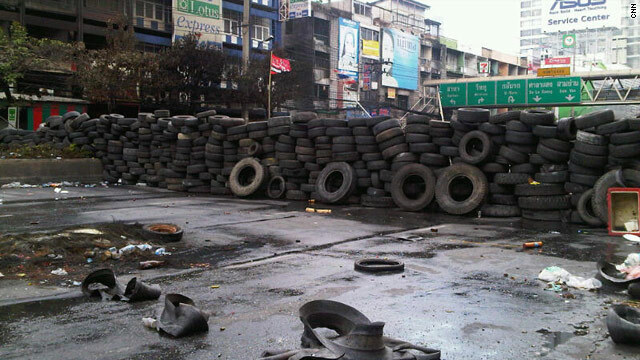 A towering pile of carefully placed tires creates a wall for protesters to hide behind in the middle of Rama 4 road in Bangkok. It was deserted and there were no fires burning for the first time in four days. A building had obviously been charred by fire, but the smoke had died down hours ago. Red Shirt supporters pointed out bullet holes where our heads had been two days earlier as we tried to get pictures of the street. The road has been the scene of loud explosions and gun battles between some of the anti-government protesters and government troops. For most residents living in the area the situation has become unbearable. Each day you see a few more pick-up trucks carrying people, pets and some of their things out of the neighborhood. On Tuesday Nog, the mother of a little girl, decided she had had enough. "We haven't had electricity since Friday. It is difficult living here. I am going far from this place. I had to rent a room," she said, as her young daughter stood with two of her neighborhood friends inside the back of the pick up. The neighbors are moving out too. They all say they can't work right now, there is no school for the rest of the week and no reason to stick around, although no one really wants to leave their homes. "It is very inconvenient," Nog said. "I have never seen anything like this." But for the first time in five days her neighborhood stayed mostly quiet during daylight hours. It is hard to say why but on Monday the Red Shirts were reported to have announced that they had agreed to a new round of talks, but by late afternoon Tuesday the government had not officially responded to the offer. The King -- who remains beloved by both government supporters and the Red Shirt protesters -- has yet to make any official announcement about what is happening in his kingdom. Parts of Bangkok have now been under siege for six weeks. Government officials estimate 5000 protestors defied the order to vacant the area. Its announcement of a crackdown late Monday afternoon resulted in more than 10 arrests, but it also seemed to inspire a surge of destructive activity from some of the protesters in the streets. The United Nations has encouraged the two sides to talk if they don't there seems to be no end in sight to the unrest.